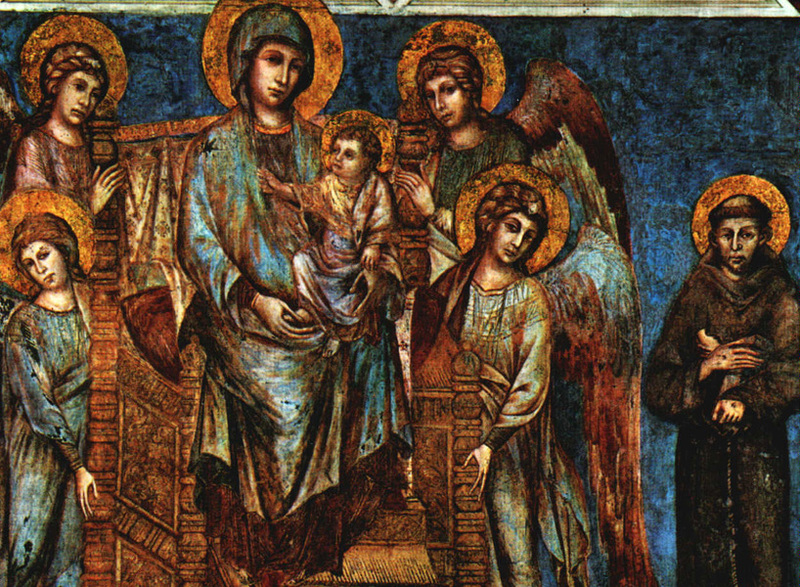 Kenney Mencher: Art History Everyone Should Know: The Byzantine Tradition and the Transitions in Painting to the Late Gothic, Giotto, Cimabue, Lorenzetti, Pisano etc. 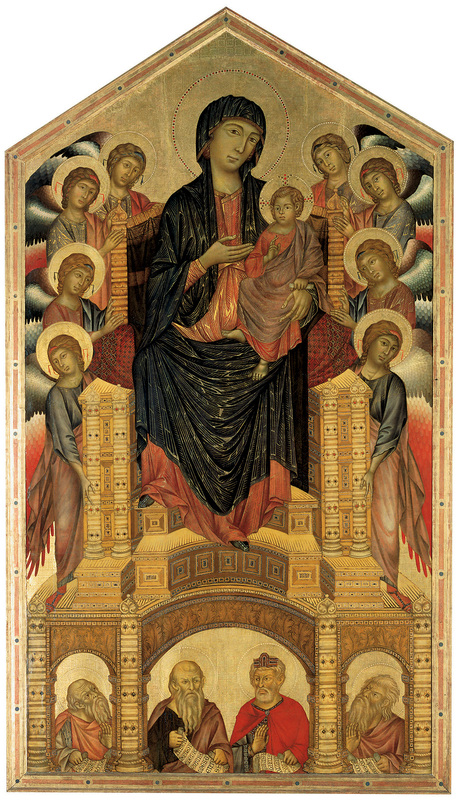 Art History Everyone Should Know: The Byzantine Tradition and the Transitions in Painting to the Late Gothic, Giotto, Cimabue, Lorenzetti, Pisano etc. Gesture and movement of the figures is life-like. The overall scene makes sense in terms of the picture plane's space. 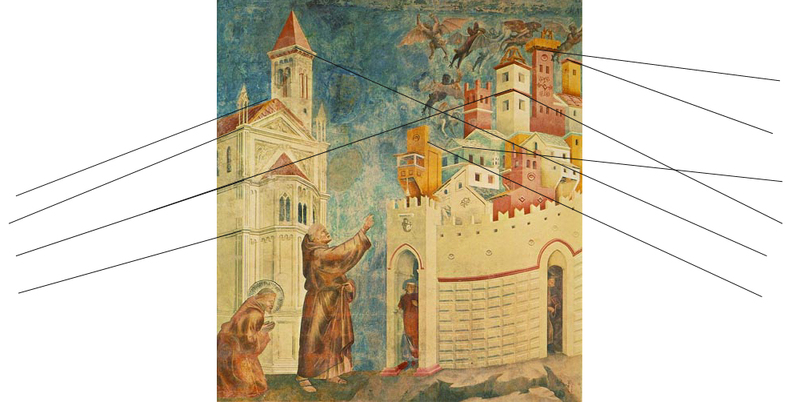 Overlapping of figures and the size scale difference from foreground to background show Giotto's attempts to create a more rational sense of space. "This is the fifth of the twenty-eight scenes (twenty-five of which were painted by Giotto) of Legend of Saint Francis. 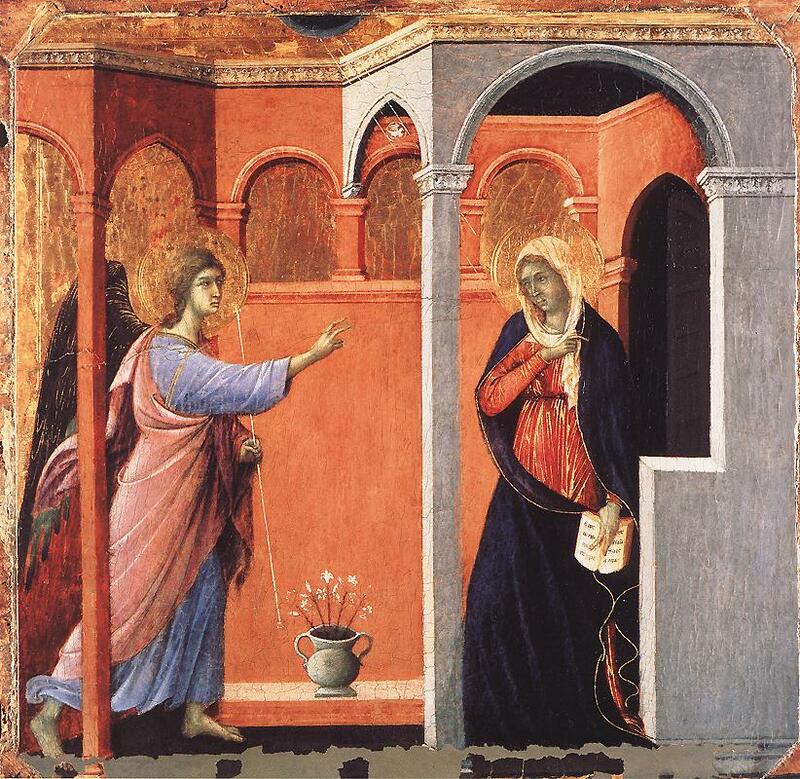 This scene gives an opportunity to examine one of the most important of Giotto's innovations. Although the mastery of the method of representing the third dimension is of fundamental importance, there are other innovations which are no less significant to the development of Western painting. 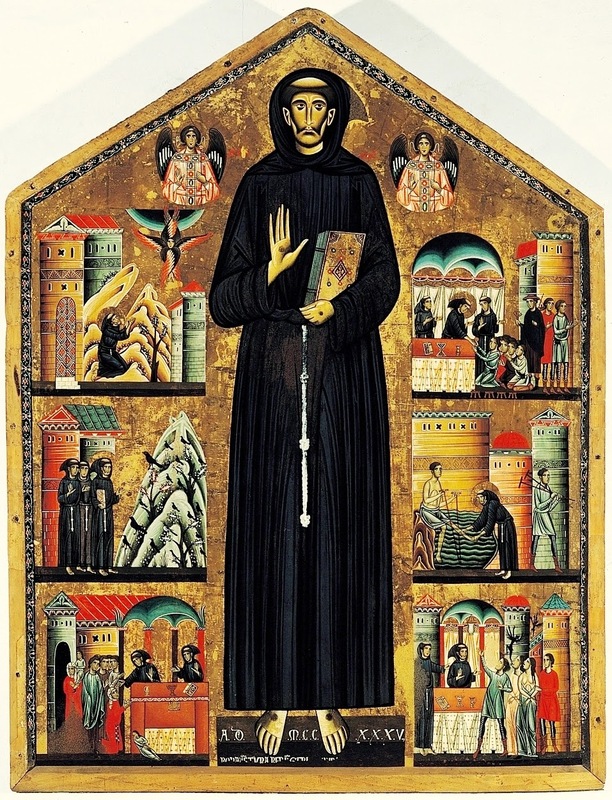 Among these must be included the use of eloquent gesture, the communication of strong emotions through attitude and facial expression, In the Renunciation of Worldly Goods, St Francis' father expresses his anger in his grimace, in his gesture of lifting the hem of his gown (as if he were about to dash at his son), and in his clenched fist; the effect is heightened by the gesture of his friend, who holds him back by the arm. Within the limits of the dignity and self-restraint that Giotto impresses on all his characters, the father's anger is expressed clearly and vividly." Perspective is a method of graphically depicting three-dimensional objects and spatial relationships on a two-dimensional plane or on a plane that is shallower than the original (for example, in flat relief). In Western art, illusions of perceptual volume and space are generally created by use of the linear perspectival system, based on the observations that objects appear to the eye to shrink and parallel lines and planes to converge to infinitely distant vanishing points as they recede in space from the viewer. Parallel lines in spatial recession will appear to converge on a single vanishing point, called one-point perspective. Perceptual space and volume may be simulated on the picture plane by variations on this basic principle, differing according to the number and location of the vanishing points. 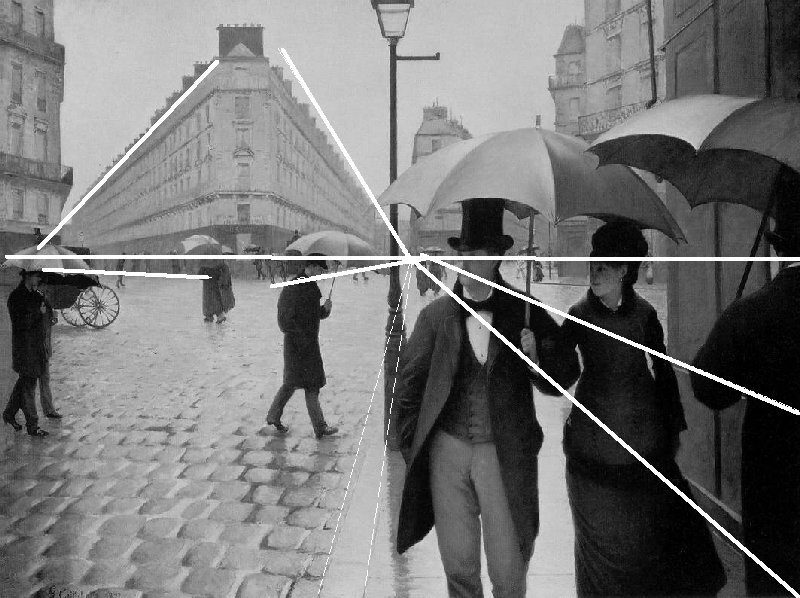 Instead of one-point (or central) perspective, the artist may use, for instance, angular (or oblique) perspective, which employs two vanishing points. Another kind of system--parallel perspective combined with a viewpoint from above--is traditional in Chinese painting. When buildings rather than natural contours are painted and it is necessary to show the parallel horizontal lines of the construction, parallel lines are drawn parallel instead of converging, as in linear perspective. Often foliage is used to crop these lines before they extend far enough to cause a building to appear warped. The early European artist used a perspective that was an individual interpretation of what he saw rather than a fixed mechanical method. At the beginning of the Italian Renaissance, early in the 15th century, the mathematical laws of perspective were discovered by the architect Filippo Brunelleschi, who worked out some of the basic principles, including the concept of the vanishing point, which had been known to the Greeks and Romans but had been lost. 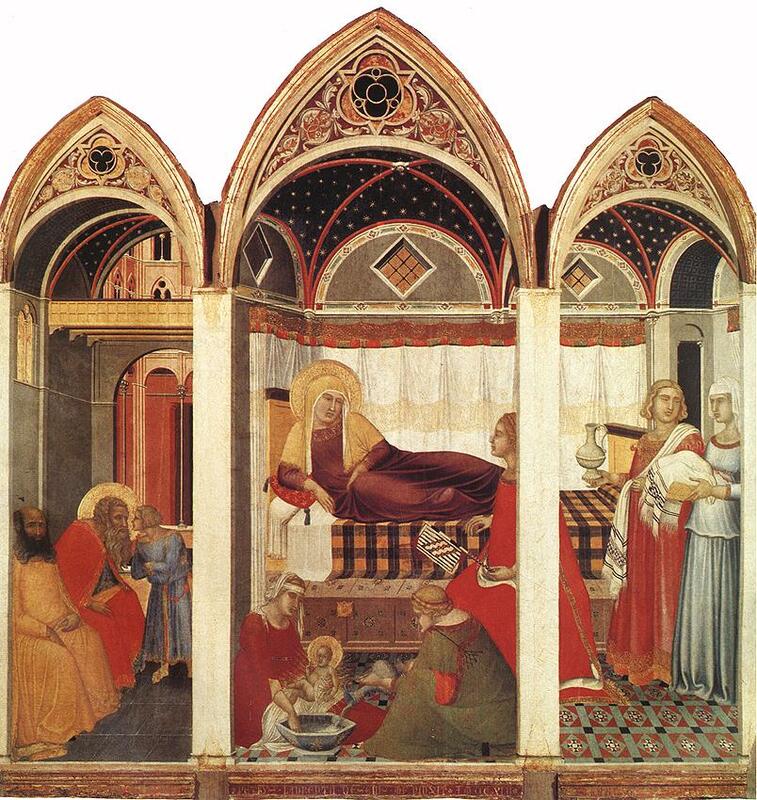 These principles were applied in painting by Masaccio (as in his "Trinity" fresco in Santa Maria Novella, Florence; c. 1427), who within a short period brought about an entirely new approach in painting. A style was soon developed using configurations of architectural exteriors and interiors as the background for religious paintings, which thereby acquired the illusion of great spatial depth. In his seminal Della pittura (1436; On Painting), Leon Battista Alberti codified, especially for painters, much of the practical work on the subject that had been carried out by earlier artists; he formulated, for example, the idea that "vision makes a triangle, and from this it is clear that a very distant quantity seems no larger than a point." Please visit this site for more of an explanantion. While at mass one day, Francis listened to the reading of Matthew 10:7-10 where Jesus tells his apostles to go and preach God’s word. He felt this was a personal calling. Though he lived a simple life, as he started preaching, he began to attract a following of men who also wished to denounce their wealth and preach God’s word. These men traveled to Rome to speak with the Pope. Pope Innocent III gave permission for them to live the life they chose. This event marked the beginning of the Franciscan order. 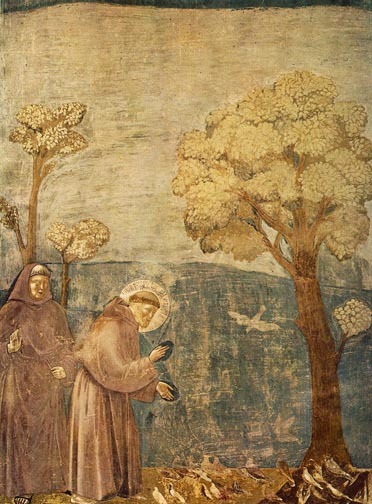 This fresco is the seventh of twenty-eight scenes of Saint Francis. It shows St Francis and the friars bending on their knees before Pope Innocent III. 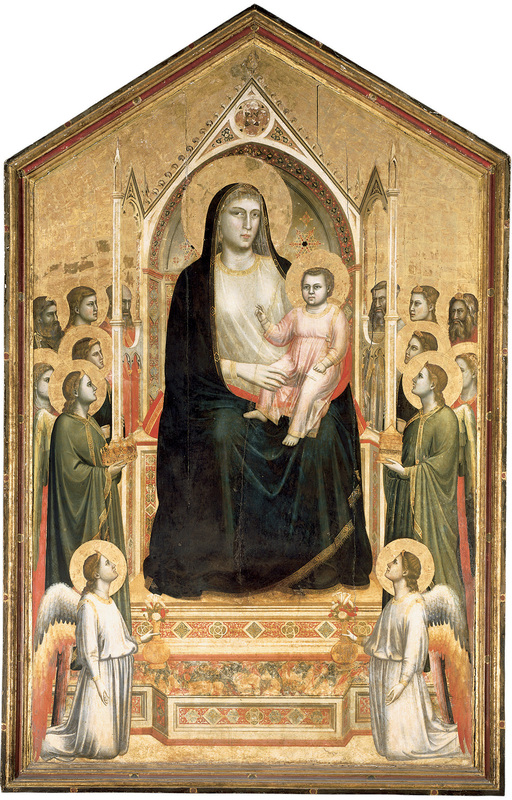 With the introduction of soft pinks and blues, we can witness Giotto abandoning the former Byzantine style whose gold images were rigid and almost cartoon-like (scroll up and compare to Berlinghieri’s altarpiece). The arches at the top of the painting provide an illusion of depth while delivering the image of Francis and the Pope closer to the viewer. Lines above the eye level tend to incline and move down while below the eye level, they move up. 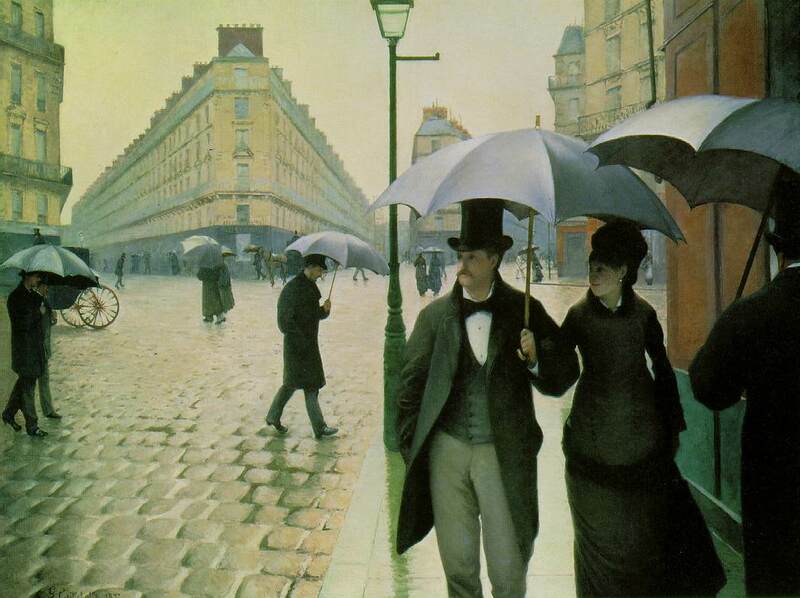 This allows the viewer to feel as if he were personally in the picture rather than being a spectator of the event. 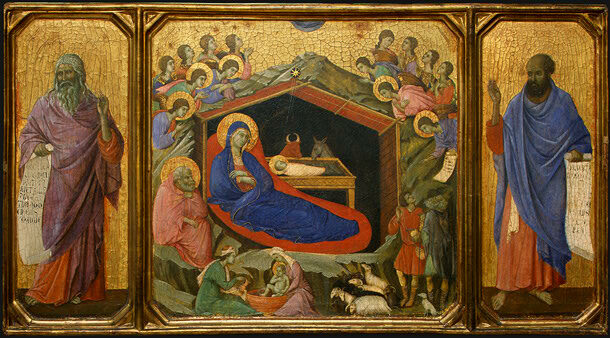 The simplicity of this painting reveals much about Giotto as a narrative artist. He reduces imagery to its barest elements without losing any part of the story. There are no architectural or decorative elements - only two men, two trees, and a handful of birds. We also see him breaking away from the old style by making the painting asymmetrical. 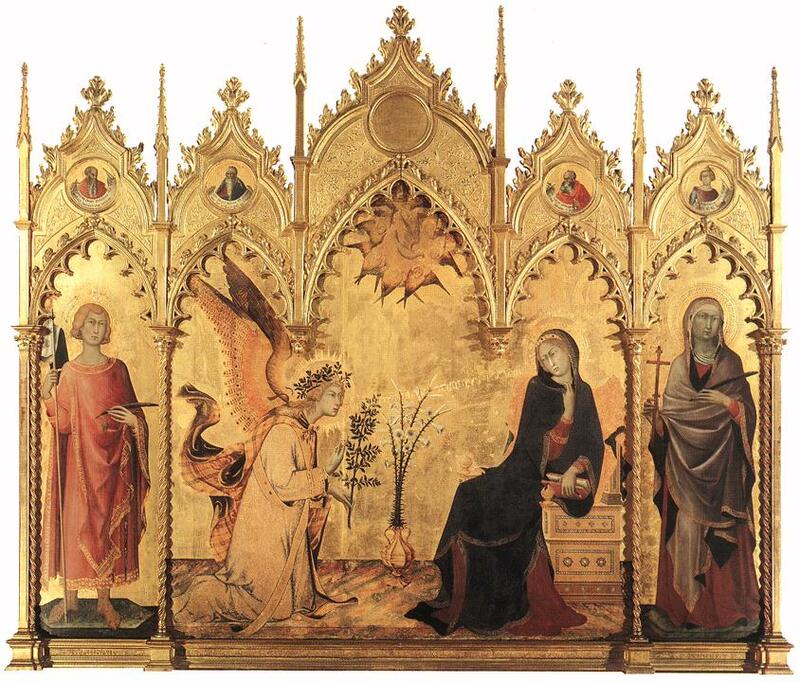 Until now, all paintings of Jesus, Mary or a saint featured them in the center of the picture facing its viewer. His standing in profile and to the side once again allows us to feel like we are more than viewing an image – we are witnessing an event. Francis Receives the Stigmata STIGMATA In 1224 Saint Francis climbed a mountain to begin a 40 day fast. During this fast, he saw a vision and experienced wounds in his hands and the side of his body – duplicating those that appeared on Christ when he was crucified. Such wounds are referred to as stigmata. This fresco is painted as if it were a low relief sculpture. 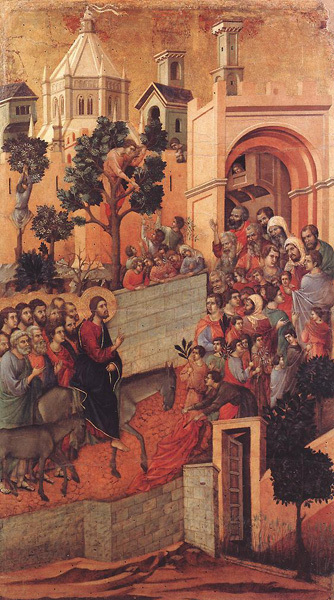 Here, Giotto uses light and shadow on the landscape to add depth. Such use of light and shade is a distinguishing aspect of Renaissance art. The majority of these scenes, mostly narrative, are revolutionary in their expression of reality and humanity. In these frescoes, the emphasis is on the dramatic moment of each situation, and, with details of dress and background at a minimum, the inner reality of human emotion is intensified through crucial gestures and glances. 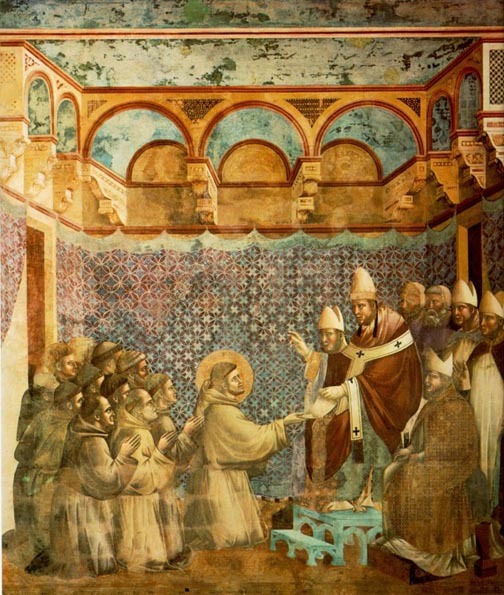 In the 19th century, however, it was observed that all these frescoes, though similar in style, could not be by the same hand, and the new trend toward skepticism of Vasari's statements led to the position that rejected all the Assisi frescoes and dated the St. Francis cycle to a period after Giotto's death. 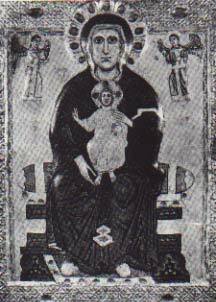 This extreme view has been generally abandoned, and, indeed, a dated picture of 1307 can be shown to derive from the St. Francis cycle. Nevertheless, many scholars prefer to accept the idea of an otherwise totally unknown Master of the St. Francis legend, on the grounds that the style of the cycle is irreconcilable with that of the later Arena Chapel frescoes in Padua, which are universally accepted as Giotto's. 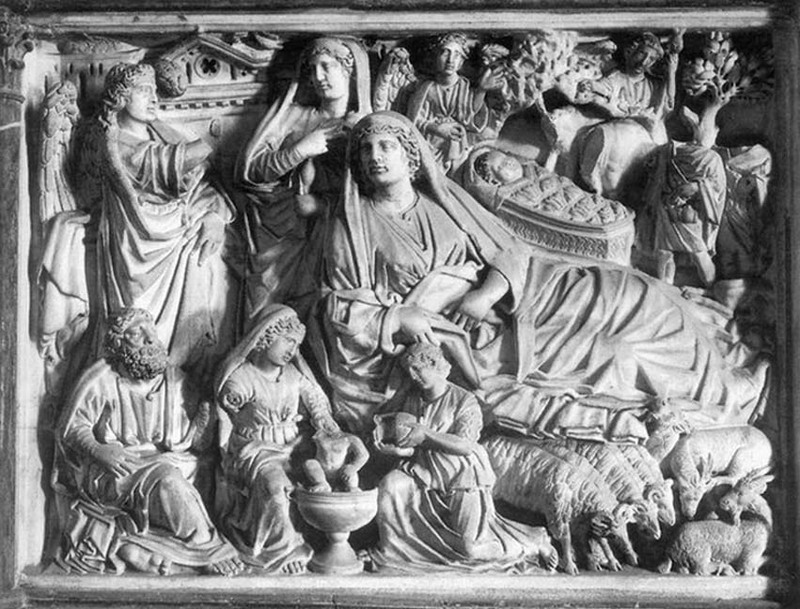 This involves the idea that the works referred to (in Giotto's lifetime) by Riccobaldo cannot be identified with anything now extant and must have perished centuries ago, so that the early 15th-century sculptor Lorenzo Ghiberti, Vasari, and others mistakenly transferred the existing St. Francis cycle to Giotto. Five hundred years of tradition are thus written off. 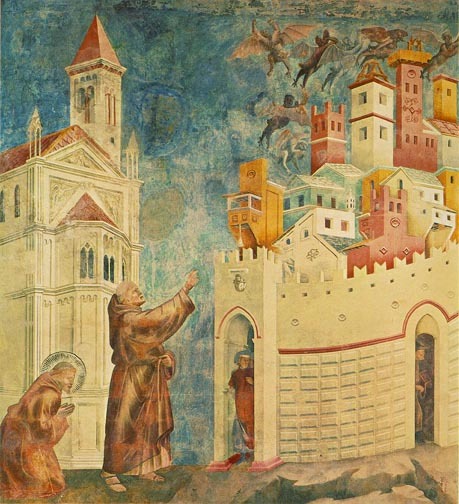 Still more difficult, if Giotto did not paint the St. Francis frescoes, major works of art, then they must be attributed to a painter who cannot be shown to have created anything else, whose name has disappeared without trace, although he was of the first rank, and, odder still, was formed by the combined influences of Cimabue, the Florentine sculptor Arnolfo di Cambio, and the Roman painter Pietro Cavallini--influences which coalesce at Assisi and may be taken as the influences that formed Giotto himself. 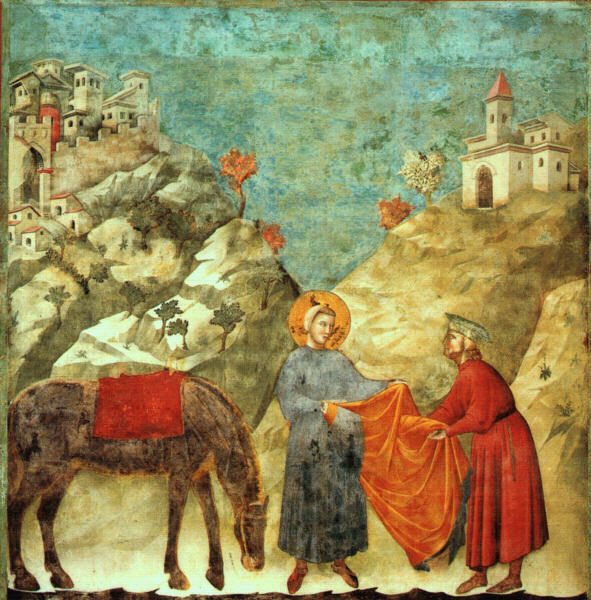 Arising out of the fusion of Roman and Florentine influences in the Assisi frescoes, there was later a tendency to see the hand of Giotto, as a very young man, in the works of the Isaac Master, the painter of two scenes of "Isaac and Esau" and "Jacob and Isaac" in the nave above the St. Francis cycle. If this theory is accepted, it is easy to understand that Giotto, as a young man, made such a success of this commission that he was entrusted with the most important one, the official painted biography of St. Francis based on the new official biography written around 1266 by St. Bonaventura. 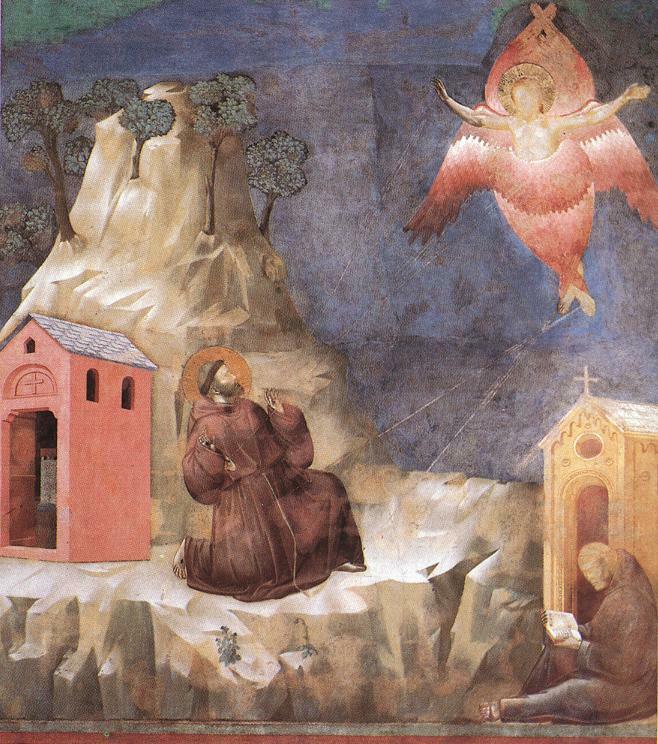 In fact, the whole of today's mental picture of St. Francis stems largely from these frescoes. 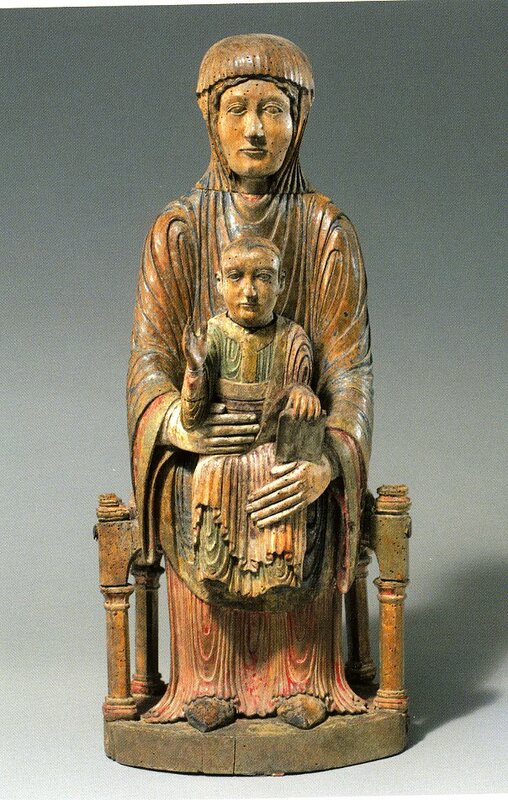 Clearly, a man born in 1276 was less likely to have received such a commission than one 10 years older, if, as was always thought, the commission was given in 1296 or soon after by Fra Giovanni di Muro, general of the Franciscans. 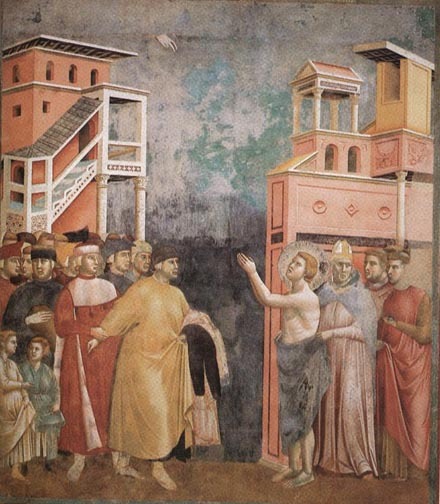 The works in the Lower Church are generally regarded as productions of Giotto's followers (there are, indeed, resemblances to his works at Padua), and there is real disagreement only over the "Legend of St. Francis." 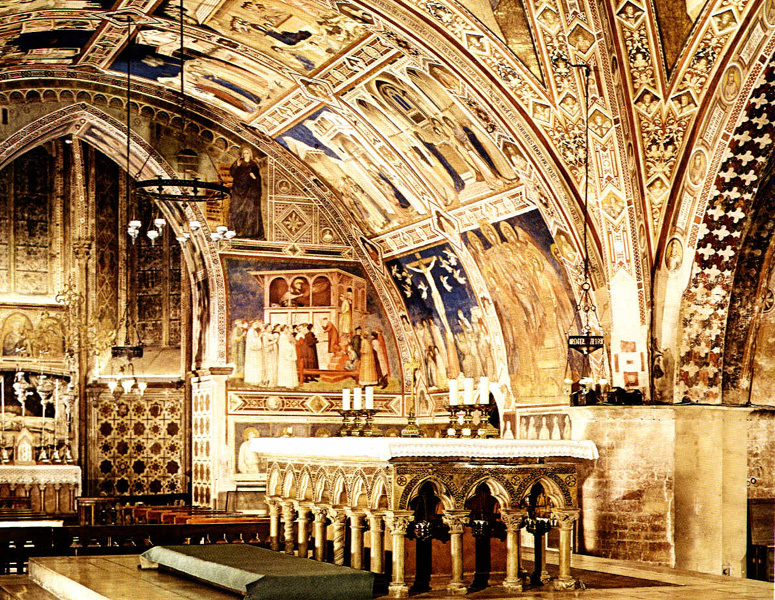 The main strength of the non-Giotto school lies in the admittedly sharp stylistic contrasts between the St. Francis cycle and the frescoes in the Arena Chapel at Padua, especially if the Assisi frescoes were painted 1296-c. 1300 and those of the Arena c. 1303-05; for the interval between the two cycles is too small to allow for major stylistic developments. This argument becomes less compelling when the validity of the dates proposed and the Roman period c. 1300 are taken into account. 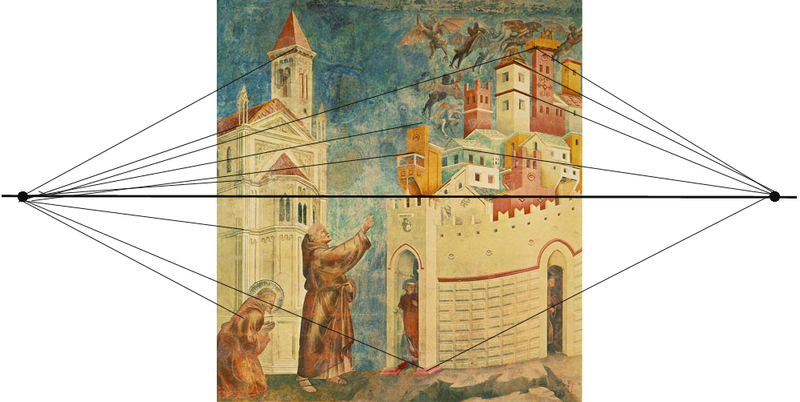 As already mentioned, the Assisi frescoes may have been painted before 1296 and not necessarily afterward, and the Arena frescoes are datable with certainty only in or before 1309, although probably painted c. 1305-06; clearly, a greater time lag between the two cycles can help to explain stylistic differences, as can the experiences that Giotto underwent in what was probably his second Roman period. "The Assisi Problem." Britannica 2001 Standard Edition CD-ROM. Copyright © 1994-2001 Britannica.com Inc. November 26, 2002.